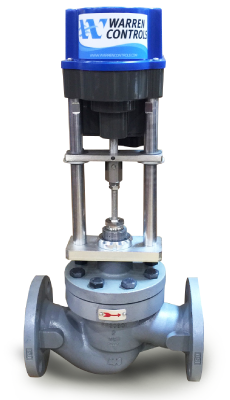 Thrd-FLG, ANSI 150/300, 1/2" - 4"
Series 5800E has a high quality, modulating, Linear, Industrial Electric Valve Actuator and features bolted bonnets and cage-retained seats in rugged high efficiency bodies of steel or stainless steel for ease of maintenance and a variety of trim materials and port sizes.  The equal percentage and linear plugs provide excellent modulating control of a wide variety of fluids. The Series 5800 is ideally suited where value and long life are important objectives for applications including but not limited to the Chemical, District Energy, Food & Beverage, General Service, Marine, Pulp & Paper, Refining, and Pharmaceutical Industries with temperatures from -20 to 800ª F, severe service, dirty fluids, high pressure drops, and corrosive fluids. SIZES: 1/2 to 4 in.